Free Basic Data Management System for Pro/Engineer, Solidworks and other files. a. Regenerate the model and drawing views for all sheets. c. Open the default drawing model. d. If an assembly – Export a text BOM. e. Export a parameter information file. g. Close the model window. h. Activate the drawing window. i. Optional – Export one DXF file per sheet. i. Parse the Parameter Information file for the drawing revision and ECO number (optional). ii. Optional - Create (if not existing) a sub-folder in the Pending Release folder with the ECO number as the sub-folder name. iii. Move the data file(s) (Postscript, IGES, STEP, DXF, etc) to Pending Release folder(s) and append the file names with the drawing revision and ECO number (Optional). iv. Start an application (Ghostscript or ?) to convert the Postscript file into a PDF file. A. If the Postscript file is broken into one file for each drawing sheet (ACAD) then the user must manually append the file name with the sheet number. B. The Ghostscript application will then merge these files into one multi-sheet PDF file. v. Warn the user if the file already exists in the vault (Revision already exists). 2. 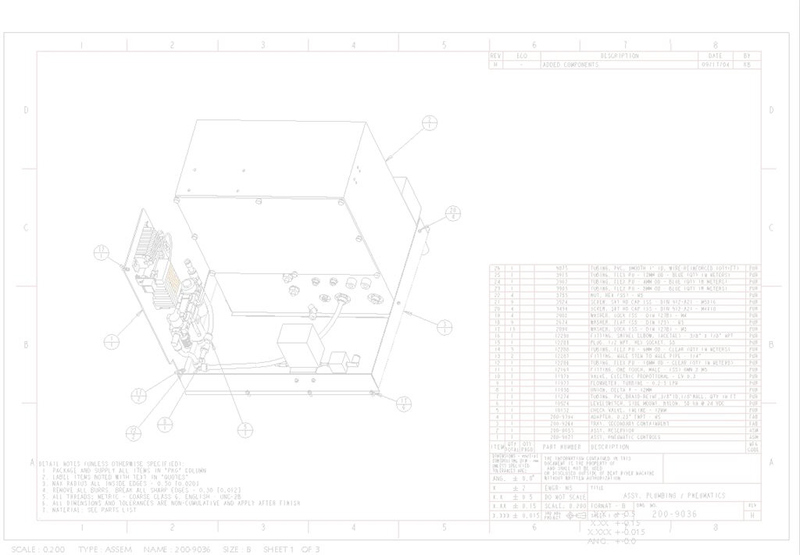 The user repeats these steps for all drawings on the ECO package. The user can also create Postscript or PDF files for other documents (Word, Excel, ACAD, Solidworks, etc) to be released and place them in the same Pending Release folder with the same file naming architecture. 3. When all the files are ready the company’s ECO process takes over. The PDF and BOM files can be printed or electronically circulated with the ECO paperwork. a. Add a “Released” (configurable) watermark to each page of each PDF file. b. Checks to see if the number and revision already exists and, if so, moves the older document to a “Holding” folder. c. Optional - Moves all older files to an “Archive” folder. 5. Optional - The Document Control personnel can import the BOM file into the MRP system. 1. The user checks in the completed drawing(s) with the configuration option “Required”. 2. The user promotes the drawings (preferably all the drawings on the ECO) in Intralink with the configurations options “As Stored” and “Dependences” set. 3. Intralink sends out an email to the "Notification" list. One email account will be a "Watched" account. i. Check out the object(s) in the RTP form to a workspace. ii. Export all objects in the workspace to a temporary folder. i. Start Pro/Engineer in the background. iii. Regenerate the model and drawing views for all sheets. iv. Open the default drawing model. v. If an assembly – Export a text BOM. vi. Export a parameter information file. viii. Close the model window. ix. Activate the drawing window. x. Optional – Export one DXF file per sheet. A. Parse the Parameter Information file for the drawing revision and ECO number (optional). B. Optional - Create (in not existing) a sub-folder in the Pending Release folder with the ECO number as the sub-folder name. C. Move the data file(s) (Postscript, IGES, STEP, DXF, etc) to Pending Release folder(s) and append the file names with the drawing revision and ECO number (Optional). D. Start an application (Ghostscript or ?) to convert the Postscript file into a PDF file. c. The batch file will then delete the temporary folder and triggering email and exit. 5. The user can also create Postscript or PDF files for other documents (Word, Excel, ACAD, Solidworks, etc) to be released and place them in the same Pending Release folder with the same file naming architecture. 6. When all the files are ready the company’s ECO process takes over. The PDF and BOM files can be printed or electronically circulated with the ECO paperwork. a. Adds a “Released” (configurable) watermark to each page of each PDF file. 8. The Document Control person “Accepts” the Promotion in Intralink. 9. Optional - The Document Control person can import the BOM file into the MRP system. Provides electronic storage of all printable released documents (Text, CAD, Images, etc) across operating systems. Only allows “read-only” access to users (Purchasing, Manufacturing, QC, etc). Automatically moves and archives previous released documents to maintain an electronic Revision History (required for ISO compliance). Provides users the ability to retrieve documentation “Packages” of assemblies. Only allows Document Control personnel to release documents. Stamps released documents with a “Released” (or any other desired text) watermark. Less work load and distraction for Engineering staff - Engineering staff are not required to provide documentation to personnel (Purchasing, Manufacturing, etc.) at every request. No confusion or errors from incorrect documents being issued – Preliminary or “In Process” documents cannot be confused with released documents since all released documents have a visible “Released” watermark. Users can retrieve complete “Packages” of documents for an assembly automatically, reducing the time to collect required information for manufacturing or quoting. Purchasing, Manufacturing and other personnel can have access to the latest documents within minutes of the release. Release documents can be easily emailed, faxed from a computer, and printed (individually or in groups) via the free Adobe PDF viewer. PDF files can be viewed on a variety of platforms (Windows, Macintosh and Unix). Can be used for any printable electronic document from MS Word files to CAD drawings. User read and write access is controlled with standard Windows user permissions. The process is simple, robust and fully automated (DOS batch files and Adobe Acrobat driven). There is no maintenance unless the server or folder names are changed and then only simple changes are required to the batch files that handle the operations.